In October, 2011 Fontänhus Motala began as an idea to help people living with mental illness find meaning and friendship in their lives. By May 2012, we had our own Clubhouse and our first members. Today, we welcome a thriving community of members to Motala Fontänhus! How did we accomplish this? A group of us, intent on turning our idea into a reality, started by visiting 2 neighboring Clubhouses, Örebro and Nyköping. We received a warm welcome at both Clubhouses, worked alongside members and staff and toured the houses. We were all touched by the stories we heard from the members about their lives and the hope they had discovered in their Clubhouse communities. After these visits, we grew even more determined and excited to establish our own place in Motala. 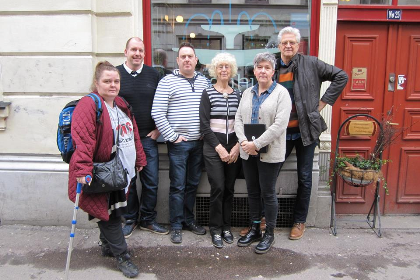 In March, 2012, I spent a week at Fountain House Stockholm, where I learned more about how a Clubhouse operates and saw the importance of the equal, respectful and collegial relationships between Clubhouse members and staff. In Motala, we invited politicians and local officials to information sessions. Over 90 people came and gave us very positive feedback. We recruited an advisory board representing employment services, insurance, healthcare and local authorities. We found a building and met with people interested in becoming members. On May 28, 2012 the first members came to our Clubhouse to work!